AP Capstone™ is a diploma program based on two yearlong AP courses: AP Seminar and AP Research. These courses are designed to complement other AP courses that the AP Capstone student may take. Instead of teaching specific subject knowledge, AP Seminar and AP Research use an interdisciplinary approach to develop the critical thinking, research, collaboration, time management, and presentation skills students need for college-level work. The College Board developed the AP Capstone Diploma program at the request of higher education professionals, who saw a need for a systematic way for high school students to begin mastering these skills before college. Higher education professionals: Learn about developing AP Capstone credit and placement policies. Students typically take AP Seminar in grade 10 or 11, followed by AP Research. Each course is yearlong, and AP Seminar is a prerequisite for AP Research. In both courses, students investigate a variety of topics in multiple disciplines. Students may choose to explore topics related to other AP courses they’re taking. Both courses guide students through completing a research project, writing an academic paper, and making a presentation on their project. Visit the AP Seminar and AP Research course pages to learn more. Send your students to the AP Seminar and AP Research pages on our AP Students site to explore the courses. AP scores for both courses are based on teacher assessment of student presentation components and College Board scoring of student-written components plus an end-of-course exam (for AP Seminar only). Visit the AP Seminar Exam page and the AP Research Exam page to learn more about the assessment of student work in AP Capstone courses. Students who earn scores of 3 or higher in AP Seminar and AP Research and on four additional AP Exams of their choosing receive the AP Capstone Diploma™. Students who earn scores of 3 or higher in AP Seminar and AP Research but not on four additional AP Exams receive the AP Seminar and Research Certificate™. Students who earn these awards can view and print their diploma or certificate online. The award is also acknowledged on any AP score report that is sent to colleges after the award has been conferred. To see how many AP Capstone awards were granted for the 2017 exam in the United States (total and per state), Canada, and outside the U.S., download the AP Scholar Counts spreadsheet (.xls/42KB). Visit AP Data on our Research site for past years’ award volumes. 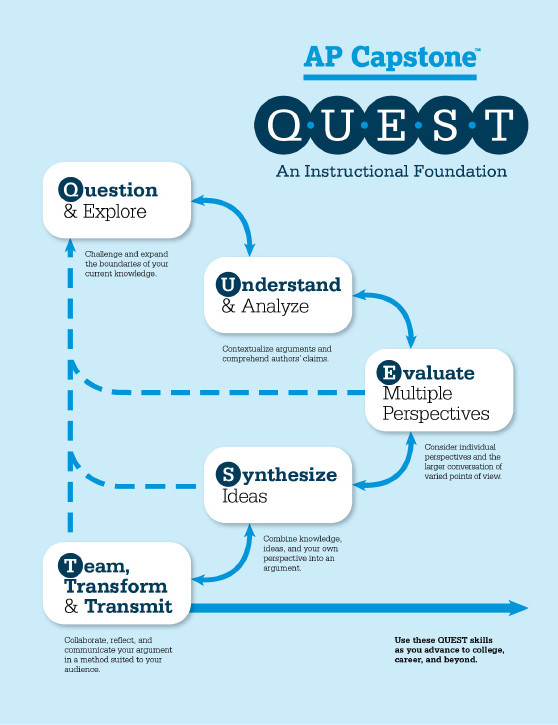 Questioning begins with an initial exploration of complex topics or issues. Perspectives and questions emerge that spark one’s curiosity, leading to an investigation that challenges and expands the boundaries of one's current knowledge. Because of the unique format of the AP Capstone courses, all AP Seminar and AP Research teachers must take part in training prior to their first year teaching the course.